Our annual silent retreat provides an opportunity to be quiet and feel God’s presence. 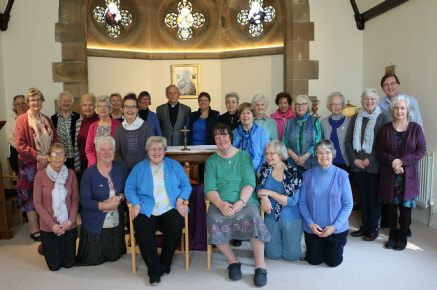 The photo above shows those who came to the 2019 retreat. In 2020, we shall again be in the welcoming and comfortable setting of St. Mary’s Monastery, Kinnoull beside Perth. It will be held from Tuesday 21st to Thursday 23rd April 2020. 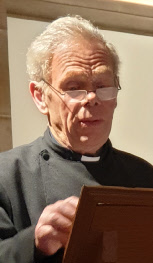 Our leader in 2019 was the Revd Martin Roff from the Diocese of Moray, Ross & Caithness. He had served most of the charges of the Diocese for varying lengths of time. Martin followed the overall pattern for the Retreat of a series of talks and led meditations on the theme “Trust in God, in good times and bad”. Those who attended commented on how much they enjoyed what Martin offered. We hope to have more details of the content on this website soon. The retreat is run mid-week from Tuesday afternoon to Thursday after lunch. The usual format of the retreat is to maintain silence in the building from around 8pm on Tuesday to around 12 noon on Thursday, though there are always areas reserved for those who want to talk during these times. There is a programme of services and talks, but it up to you to decide how much you wish to be involved. You are free to attend everything on offer or to be on your own if you wish. Wednesday afternoon is free time to explore the area or use as you wish. There is usually an opportunity to talk to the leader on a one to one basis during this time. St Mary’s completed a major refurbishment in 2017 so that most rooms are single rooms with en-suite facilities. Four rooms have shared bathrooms with one bathroom to two rooms. There is a lift serving all floors. In 2019, the cost was £160 for a single en-suite room and £145 for a single room with shared facilities. Applications and prices should be available from around September 2019 for the 2020 retreat. Please take a look at the pages for the previous Retreats to get an idea of what they are like and to look at the photo-galleries. We hope those who were there will enjoy the memories they bring back and we also hope they will encourage those who weren’t there to make a date to come to the 2020 Retreat. 2018 Retreat page... Coming soon.